Friendly Salsa classes with a skilled team of Salsa addicts. We absolutely love Salsa - the dance, the music, even the sauce, and we hope to make you fall in love with all of it too! Our classes are fun, but still progression focused, where we aim to help our students get the most enjoyment out of Salsa dancing. You focus on having fun, and we'll take care of your learning. We run our classes in Leeds every Wednesday from 8pm in Kerala Restaurant's top floor function room. 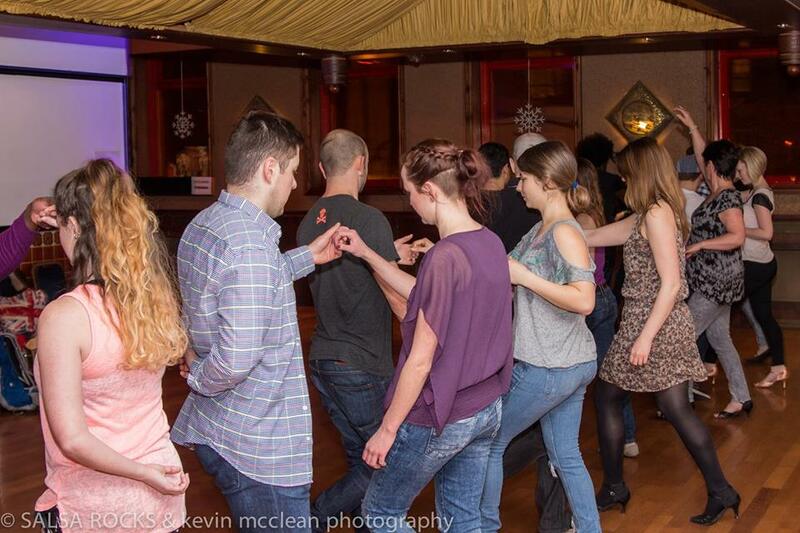 Absolute beginners are welcome every week and there is no need to pre-book. We run 4 different levels of classes from 8.00 - 10.00pm, 55 minutes each. If you have any specific queries, please do feel free to call, send us a text/email or get in touch via our Facebook page - Salsa Rocks Leeds. We encourage everyone to come early and join us for a few drinks and a little pre-class social dancing from 7:30pm. Improver Salsa with Marie-Claire and Kevin - Partnerwork. 10:00pm - Salsa club night, freestyle dancing with DJ Mark all the way up to midnight! The classes cost £5 for 1 or a discounted £8 for 2 on the same night (£4/£7 with student discount). The social costs only £3 (free if you're attending a class). Salsa Rocks are proud to offer the ONLY Salsa classes in Leeds designed specifically to fast track your progression without compromising on actual learning and technique. 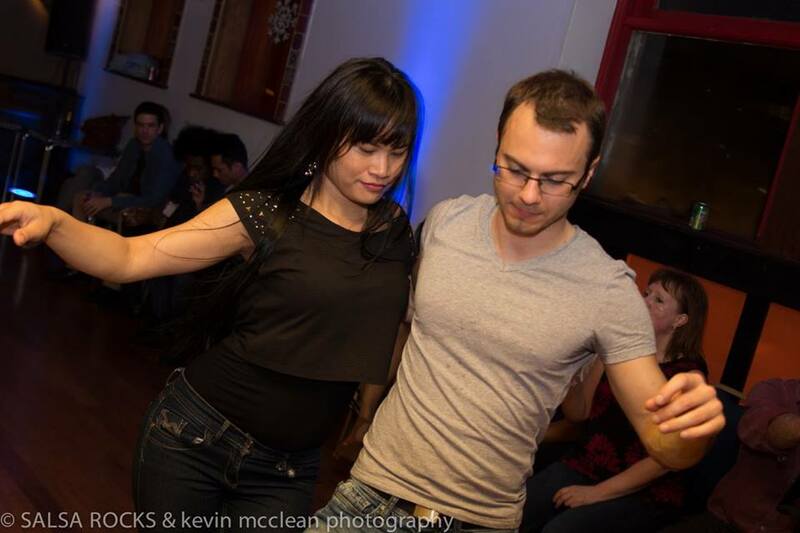 Our teachers ensure a relaxed environment where you can have fun and learn to Salsa, step by step. We take responsibility for your learning so you can focus on feeling the music, and building your confidence so you can have a good time dancing. We train hard and party even harder! Our Improver technique workshop has also been designed to allow you to make quick gains in your dancing without compromising on actual learning and technique. 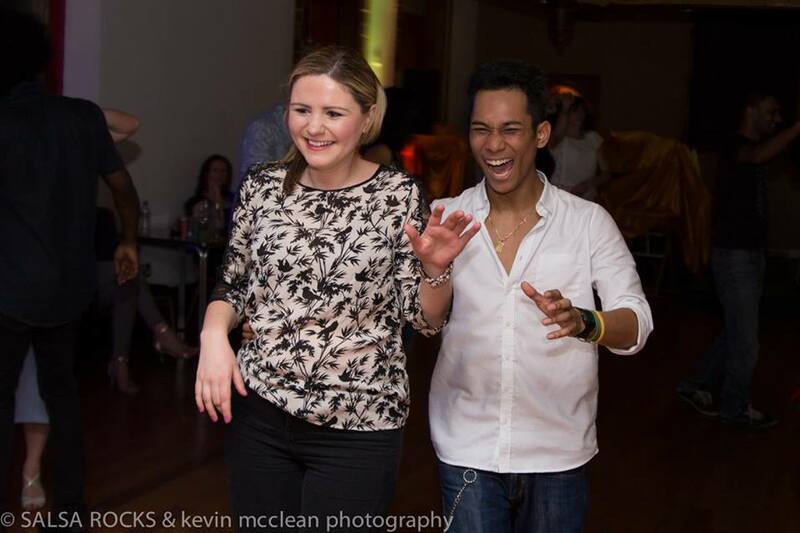 We firmly believe that a relaxed environment is essential to get the most fun and enjoyment out of learning to dance. As dancers we obviously have more fun when the moves we learn feel smooth, effortless and complement the music, with our guidance this is exactly what you will achieve. Our teachers will give you specific tips, personal corrections in an honest and constructive way which you can trust. All our teachers have travelled extensively to learn from world class Salsa instructors, to discover their tricks and secrets. In our improvers' classes, we aim to pass on these skills and knowledge. The improvers' partnerwork offers you cool new combinations every week. This is a perfect opportunity for you to drill and apply all that you learn in the technique workshop. 40 Minutes of Partnerwork - roughly 5-6 moves broken down and practiced thoroughly. Routines may feature double spins but not more. Each month the turnpattern routine will focus on a particular theme. Subsets of routines may be reapeated over the duration of the 'theme' to help develop and retain skills learnt. August - Hand Flicks: involving one or both hands! Update - These sessions are on hold at the moment and we are using this timeslot to run private workshops. This is our most technique focussed session where we work on following and leading multiple turns, arm-work for both leaders and followers and above all balance and momentum. You can expect challenging exercises, some skill building fun games and turn patterns to try and apply all that we covered in the class. We do require that you are familiar with the technique and concepts we cover in our improvers' technique syllabus. I’ve never danced before/have two left feet, will I be ok? Yes, of course. We get many complete beginners every week. In our beginners’ classes, we go over the basics every week. Our friendly teachers are experienced at teaching absolute beginners and will offer you clear and applicable feedback to help you progress with ease. No, there’s no strict dress code. Most people turn up in smart casual wear. For guys, smart shoes or trainers are fine. For ladies, very high heels will feel uncomfortable, and we recommend any sort of comfortable footwear including trainers. For improvers classes and above, we recommend the ladies to wear salsa shoes or jazz slippers and quite a few ladies wear Tom's slippers which have a nice not too sticky sole. Men should try not to wear grippy rubber soled sneakers. Any comfortable non-grippy soled shoes will do. Come talk to one of our teachers if you want to know a cool way of converting your favourite comfortable shoes into salsa shoes! I don’t have a partner, is that okay? You are welcome to bring someone along but don’t worry plenty of people come on their own. You will be assigned a partner in class and partners are rotated regularly so that you get to meet and practice with loads of great people. Please feel free to get in touch if you have any questions about the classes or even about Salsa music or dance. You can find our contact details at the bottom of this page. See you at Kerala for another Rocking Wednesday! !